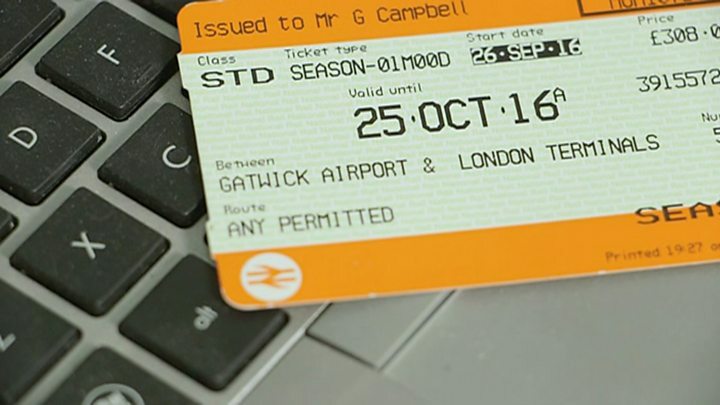 Forged rail tickets are being sold on a hidden part of the internet and being used at stations without detection, an undercover BBC investigation has found. They can be bought for a fraction of the genuine fare on the "dark web", using the virtual currency Bitcoin. BBC South East bought a first class fare from Hastings to Manchester, and a monthly ticket between Gatwick and London, using them without problems. The fraudsters said they were offering "an affordable public service". The group, who are not being named by the BBC, said in a statement: "The train companies keep stuffing their pockets with public subsidies while treating the operation of rail services as an inconvenience. "No-one should be ashamed of getting one over companies like Southern Rail. "We wish one day everyone will be able to use an affordable public service. Until then, we will be providing it." The fake first class ticket to Manchester was purchased for £111, instead of £285, while the monthly season ticket from Gatwick was sold to the BBC for £100 rather than the retail price of £308. The web-seller said the magnetic strips would not work but rail staff would still let passengers through the barriers. The fake tickets were used on 12 occasions, and each time they failed to be accepted by the barriers, but BBC reporters were allowed through without any questions asked. They were also carrying genuine tickets. Rail fraud investigator Mike Keeber said the counterfeit tickets were very convincing, but "there's something on there that shouldn't be on there". "I'd rather not say what it is, as people who make this [could] change it and make our lives harder." Some transport firms are testing new technology, including Transport for London which uses bank cards, so everything is traceable back to an individual's bank. The Rail Delivery Group, which represents train companies, said fare dodgers "deprived the railway" of about £200m a year. It said staff carried out regular inspections on trains and at stations, and being in possession of a forged ticket was a criminal offence, risking a hefty fine or prison sentence. Det Insp Jeremy Banks, from British Transport Police's Cyber Crime Unit, added that it worked closely with the rail industry, and police forces nationally, "to investigate fraud and bring offenders before the courts". "We are aware that criminals have been using the dark web in order to exploit rail firms by fraudulently selling tickets," he said. Watch a full report on BBC Inside Out South East - BBC One on Monday 31 October 19:30 GMT. Video Technology explained: What is the dark web? Guide: What is Bitcoin and how does Bitcoin work?